The road to find a great whitening system has been long, but thankfully today I can say the journey has been worthwhile. With the introduction of the KOR system we now have a product that is easy to use, has minimal sensitivity, and most importantly makes our patients happy. You may have seen ads for whitening in one office visit that tout the use of a laser or special lights. It turns out none of that is necessary. 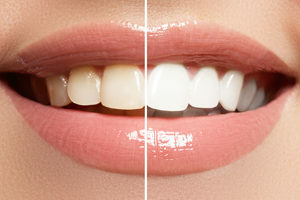 In fact, independent studies show that lasers and lights have no effect on the whitening process! The KOR system is based on scientific principles. It uses a simple 2 step process. In the first step the patient whitens at home while sleeping with form fitting mouthpieces made from a precise impression done in the dental office. The mouthpiece is comfortable and easy to take in and out. Usually the patient will do this for 14 consecutive nights and some times longer if the teeth are very dark. Instructions are given when the mouthpiece is delivered in the office and a great You Tube video showing how it is done is available for use at home. Sensitivity is controlled by a special formula that is applied to the teeth by the patient at home at night before whitening and in the morning after whitening. After whitening at home, the second step is one easy visit in the office where the patients gums and cheeks are protected and a strong whitening agent is applied. The result is a super white smile and the patients are thrilled! You may be wondering why the whitening can’t just be done in the office like many ads we see. It turns out that whitening at home for two weeks actually “conditions” the teeth so the in office whitening works like magic. You have to see it to believe it. The cost for the process is very reasonable, in fact far less than other cosmetic procedures like veneers or bonding. Why not give this a try next time there is a big event coming up or you just want that winning smile! Comments Off on Finally, Whitening That Works!